Agartala, Jun 16 : Three traders and their driver were kidnapped by tribal guerrillas from Mizoram, police said here today. “Five businessmen from northern Tripura went to adjoining western Mizoram on Saturday in connection with their trade. Armed militants waylaid their vehicle and kidnapped three traders and the driver of the car,” a Tripura police spokesman told reporters. Two traders managed to escape when the members of the National Liberation Front of Tripura (NLFT) stopped the vehicle in western Mizoram’s Faileng village, 20 km from the Tripura-Mizoram border. Tripura Police have asked their Mizoram counterparts to rescue the hostages. The Border Security Force (BSF) has also been alerted to nab the militants if they tried to cross the India-Bangladesh border. The NLFT militants in separate incidents had abducted three Tripura businessmen and a telecommunication professional from the same area in Mizoram last year. However, the captives were freed after a few months following payment of ransom money. After the erection of fencing and strengthening the security along the India-Bangladesh boundary with Tripura, the NLFT extremists use Mizoram to cross the border. 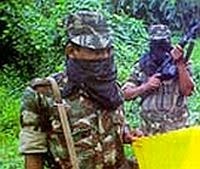 The NLFT guerrillas, with their base in Bangladesh, have been kidnapping people in Tripura and Mizoram to collect ransom. Mizoram has unfenced and porous international border of 404 km with Myanmar and 318 km with Bangladesh. Tripura also shares 856-km-long border with Bangladesh and some parts of the border areas are still unfenced.